I’ve had a few opportunities to shoot the Springfield Armory 911 at industry events here and there. Based on quick experiences shooting a magazine or two, I walked away impressed. Recently, one showed up here, so I had a bit more quality time with the pistol. 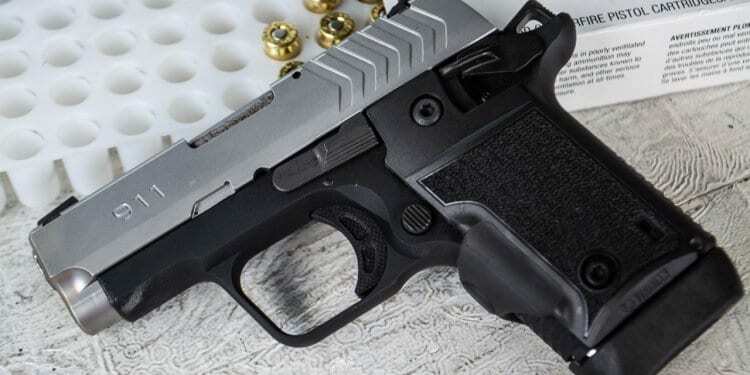 Make no mistake; this is a pocket-sized pistol with a length of five inches, a height of just four, and a 2.7-inch barrel. However, it has features and design elements that make it operate like one of larger size. The 911 is a single-action pistol complete with ambidextrous frame-mounted safety levers. As you might guess by its size, the 911 is a .380 ACP. 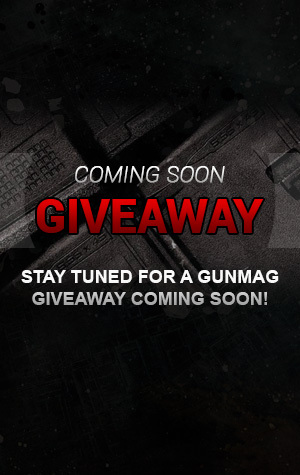 It ships with two different magazines, a flush-base version that holds six rounds and an extended one that fits seven. For me and my size large hands, I get a solid two fingers on the grip with my pinkie finger curled underneath. Using the extended mag, I can get that pinkie on the front of the grip where it belongs. I’d carry this pistol with the extended mag for grip and control reasons and tote the flush magazine as a spare. Even with the pinkie extension the 911 it’s plenty easy to conceal. The pistol is a true single-action design, and it has an ambidextrous frame-mounted safety – just like a 1911 only smaller. The frame is aluminum while slide and barrel are constructed from stainless steel. 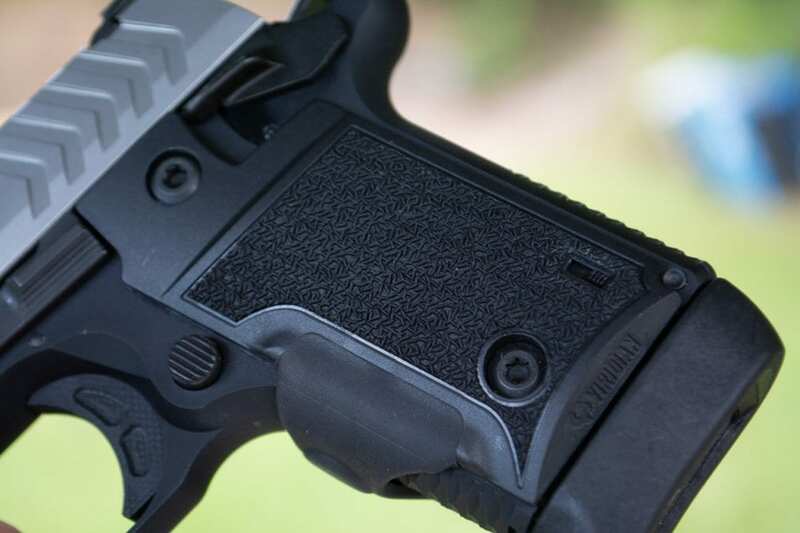 You’ll find nice touches like custom “Octo-Grip” texturing on the front and back of the grip. The standard model grip panels are made from durable G10, but the model shown here comes with an integrated green Viridian laser. You’ll also find real night sights with the front being am Ameriglo green Tritium vial surrounded by a yelp ring. 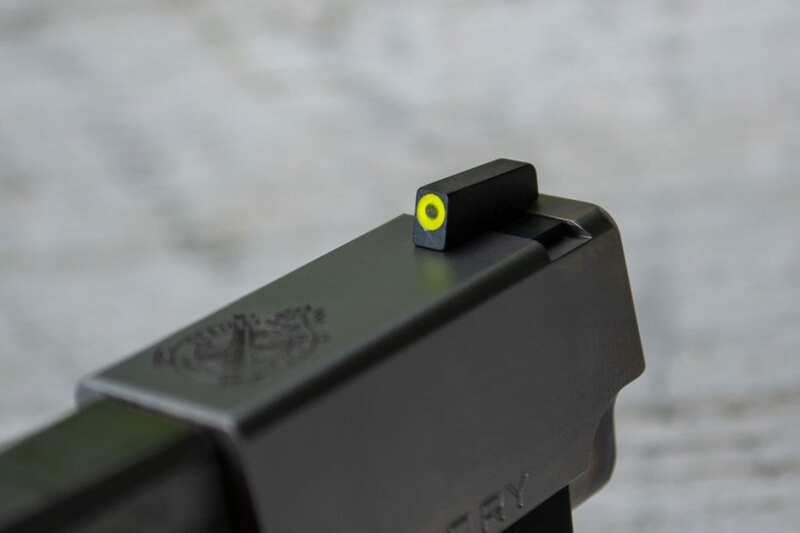 The “U” notch rear sight is flanked by dual Tritium dots surrounded by white circles. All models feature true Tritium night sights. While small, and weighing just 12.6 ounces empty, the 911 shoots gently. Using both the laser and sights in the late afternoon and early dusk outdoor conditions, it was easy to put all shots into a paper plate-sized target at 10 to 15 yards. The pistol is certainly capable of more accuracy than that when rested, but that wasn’t relevant to my trial. I was more interested in how easy it was to get hits with a compact pistol and correspondingly short sight radius. The five-pound but very crisp single-action trigger made this gun easy to shoot well. Combined with smooth recoil even when using defensive .380 ACP rounds, it’s a gun that’s pleasurable for practice too. The standard 911 comes with G10 grips, but you can also order one with a built-in Viridian green laser like this. For me, this would make an excellent pistol for pocket carry. 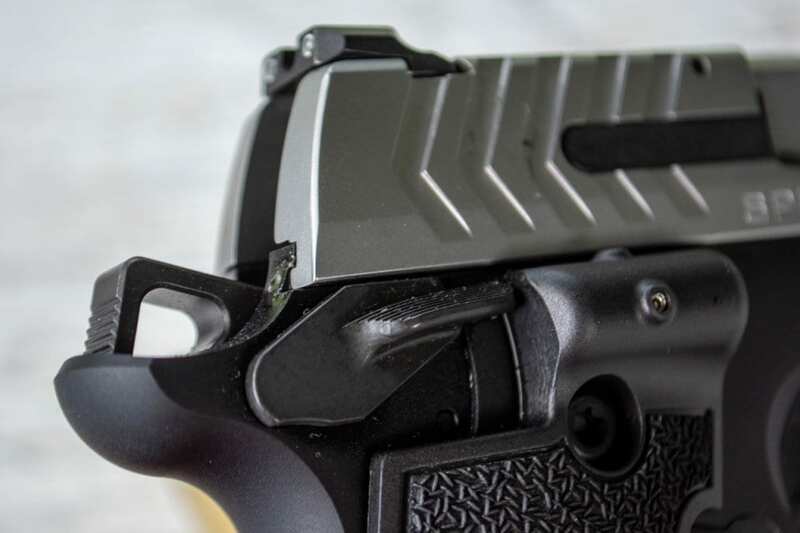 There are certainly holsters for IWB, and it would work fine for that, but it’s small size and flat profile provide plenty of additional options. It can indeed serve as a primary defensive gun, but I also think it’s well-suited to a backup pistol using an ankle holster. Its size and weight would make carry in that mode effortless. Nice gun. It retails for $599. “Yelp ring”. Why is it called that? I like Springfield. Good pistols. I’m going to guess that auto correct changed it from yellow. Your link on the “rat tourniquet” sent me to Springfields site. Is Ruger’s 10/22 still an ideal first rifle?